From basic research it has been established that our families commenced with the arrival in Australia of brothers Jacob and Friedrich Ludwig Anthes, young boys from Frankfurt-am-Maia in Germany. Spoken references have been passed down to their children and grandchildren which include mention of Alsace-Lorraine in France. other references have surfaced which indicate that the family was French, the mention of a General d'Anthes, that the family were aristocrats, a relationship to princes and that the boys were sent to Australia to avoid military service against relatives. No documentary evidence of the above references have yet surfaced and it is difficult today to know in what context such references were originally made. The only known record of the European past is a photograph taken in Frankfurt in 1885. 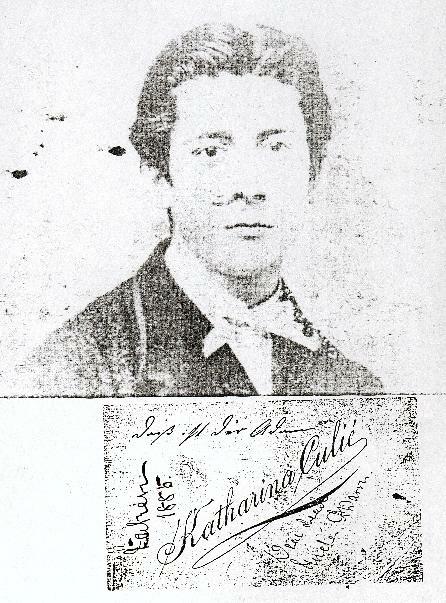 A card accompanying the photograph has the handwritten entry "taken 1885" and "Dear (unreadable) Uncle Adam". 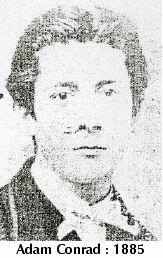 The photograph may be of Adam Conrad, a younger brother of Jacob and Friedrich Ludwig. It is likely that Adam Conrad visited Australia as Susannah, a daughter of Friedrich Ludwig, is recalled as saying that Conrad was very tall and handsome in his Prussian Guard uniform. It would be interesting to know if Adam Conrad visited both of his brothers and their families and also the circumstances of his visit. From available records both in Australia and Germany it can be certain that Jacob and Friedrich Ludwig were the first and second born children of of Johann and Susanna Anthes of Frankfurt. Johann was born in Langen, near Frankfurt, in 1765. Information obtained from church records at Langen, whist neither comprehensive nor conclusive, would indicate that the family can be traced back to Wenz Anthes who was born in Gross Gerau, also near Frankfurt, in 1550. Alongside these families of Germany are those known to be established in Alsace some time prior to 1731 and those families may be about whom the references to aristocracy are directed. Whether the families of frankfurt and Alsace were related is not yet proven. Their close geographic proximity would make it appear likely but how and when that relationship occurred would require more research. Alsace, a province of France, has changed hands between France and Germany at least four times in modern history. The border of Alsace lies approximately 75 miles south west of Frankfurt-am-Main and one of its principal cities, Strasbourg, a further 35 miles south of that border on the Rhine river. Langen is approximately 15 miles south of Frankfurt while Gross Gerau is 10 miles south of Russelsheim, a town at the junction of the Main and Rhine rivers, approximately 20 miles west of Frankfurt. The distance from Frankfurt to Strasbourg is similar to that of Sydney to Newcastle, Lithgow, or Wollongong, an area in which reside most of the known Australian Anthes families. Small references to the european families have been made in published works and in press articles. One reference has been noted to the family being ship builders and a book on economics, written by an Anthes, was in use for study purposes. An item in a Reader's Digest byline mentioned that a prince had been killed in a sword fight with a barron d'Anthes in the past. In 1981 the Canberra Times reporting on the FIFA World Youth soccer championship held in Australia mentioned Holger Anthes as a West German team member. The Hong Kong Standard of April 1984 reported the arrest in West Germany of Dietmar Anthes for spying.